Today we've published a new (= face lifted) version of X-tensive.com. Changes there aren't dramatic, but I like the way it changed. Mainly, we touched the front page and DataObjects.Net page. Press F5, if you feel there is something wrong - old CSS might be cached. Note that it's a beta version, so there are lots of issues - some links from first page banner points to wrong articles; plus, there are pearls like "Localized versions of objects (January 2010)" (factual mistake: this is already implemented as Localization sample). They'll be eliminated during this week. 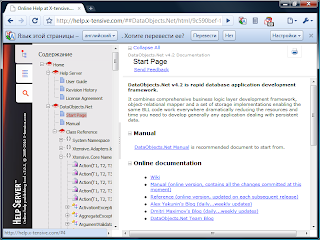 DataObjects.Net v4.2: the first v4.X release with Manual (we're true programmers ;) ) & tons of new features. For now you can check out the release candidate. Help Server v3.0 fully supporting keyboard-only navigation and two absolutely new, shiny skins (check out). Have you ever seen more pleasantly looking online help browser? For me, now MSDN web site looks pale in comparison to it, not speaking about the usability. It happened: now you can download DataObjects.Net v4.2 Release Candidate. Its reference and manual (in PDF) are available there as well. Please refer to this post for details. The version we've published must be quite stable - especially, for Microsoft SQL Server and PostgreSQL. I just looked up test results @ our build servers - from 0 to 2 tests fail there out of ~ 1380 in different test configurations(mapping scenarios) for these two database servers. So v4.2 RC is more stable than any official release we published earlier. Database creation wizard must be added for SQL Server! Oracle support for 9i and 10g is broken in the current version (AFAIK, because of schema extractor bug), so you can use it only with Oracle 11g. A set of sections must be added, including "Versions, CC & locking", "Full-text search", etc. System namespace contains classes from mscorlib.dll, but doesn't contain our own ones. Must likely this is a result of bug in Sandcastle. .HxS version: all resources from Manual are missing there (images, CSS, etc.). Since .CHM version contains all these files, this can be a result of bug in Sandcastle. All connection URL lists in samples must be extended to support default SQL Server Express installation and, likely, SQL Server CE database. WPF Sample logo: we must provide 64x64 icon here (current one looks absolutely inacceptable in Windows 7 taskbar). - PlainWpf: Customers, Add ..., Close - error. - PlainWpf: Default number is 0. KeyGenerator bug, or? - Mvvm: error on any Add/Open action. We're going to fix most of these issues on this week (e.g. likely, the issues related to Sandcastle won't be fixed) and release v4.2 final. There will be minor updates related to code base as well - mainly, bugfixes, if something new will be found.